Ah, macarons again! I actually made these quite a while ago, but I haven't gotten around to posting about them since the recipes are so long. Regardless of that, macarons are fun to make and easy to love. If you haven't yet, do give them a try! I've made similar macarons before, but this time I'm folding the almond praline into a buttercream rather than into a chocolate ganache. They're simple, clean-tasting and rather crunchy. And delicious, but I don't need to tell you that. Pipe small rounds on a baking sheet with baking paper. If you'd like, sprinkle some extra ground almonds on half of them. Leave at room temperature for 30-60 minutes, to form a skin. Bake at 150°C for 10 minutes or so. (I have a convection oven, and in my earlier attempts, I baked them for 15 but am now down to about 10.) Let them cool completely before filling. Unused shells can be frozen, or kept in an air-tight container for a day or so. Lightly toast the almonds, either in the oven or in a dry frying pan. Chop coarsely. When the caramel has cooled, coarsely chop it and place in a food processor. Run into a very fine powder. This is your finished praliné - keep it in a tight-lidded jar. Beat the egg yolks until fluffy. Bring sugar and corn syrup to a boil, and immediately remove from heat. Pour over the egg yolks and beat at high speed until fully cooled. (Try not to get any on your beaters, or it will spin to the sides of your bowl. Spread - or pipe - the cream onto half of the macaron shells, top with the remaining shells. Eat right away or freeze. They look great! And totally delicious with that buttercrem! Wow! 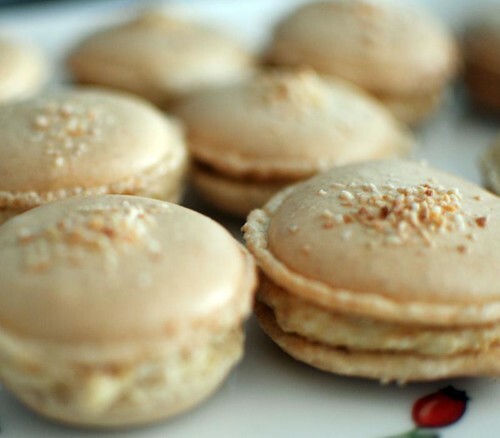 Yummy, i am totally addicted to Maccaroons. These look amazing and im dying to try the recipe.